Summer holiday season is upon us, and while there is nothing better than switching your out-of-office on and relocating to a beach, getting there can be a little less fun. Packing for holidays is something of an art, and for those of us limited to 25 holiday days per year, it's a skill that can take years to perfect. How much should you bring? Should you pack by outfits? Do you really need heels on a beach holiday? Many successful fashion bloggers have to pack suitcases every week as part of their jobs, as they go to the airport almost as often as we go to the supermarket, so they are the perfect people to answer these questions and more. 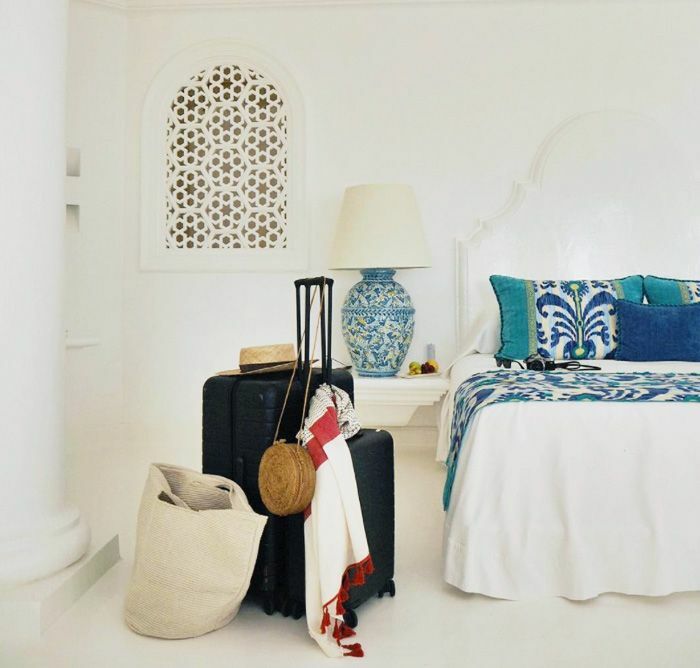 We've turned to the most stylish frequent flyers we know to find their experts tips for taking the stress out of holiday packing, just in time for your summer getaway. Scroll below to see the packing tricks that our favourite fashion bloggers wish they could keep a secret. Every fashion blogger we asked about their packing tips revealed they plan set outfits. Alex Stedman of The Frugality is the definition of a frequent flyer—this year she has been to Rome, Spain, New York, Paris and Barbados, often on short work trips. She tells us: "My friend, Laura from Wardrobe Icons, always said 'Don't pack things, pack outfits,' and that really rings true for me. And always pack outfits you can't wait to wear; it solves a lot of problems of what to wear. I'm a different person on a trip/holiday and have more time to enjoy taking photos, so I pack the clothes to reflect that!" Lindsey of Ropes of Holland agrees, explaining: "You will never wear more than 50% of what you pack. You'll have your favourite pieces and wear them on repeat in different ways. So I always pack in outfits now, after a good try-on session, to make sure I feel good in everything." This is particularly important for travelling by carry-on she adds: "Pack day by day in outfits, so you know exactly what to wear and when." This is also Rosie Fortescue of At Fashion Forte's number one tip: "My tip would be to try and plan outfits. Having said this I always over pack but I would rather have too much than too little! An idea of outfits is key so you don't panic when you're there." Alex Stedman not only packs in outfits, she also organises her suitcase by a strict colour scheme so that everything will go together. This is her main trick to travelling with just a carry-on. "Pack in a colour scheme and don't deviate. Then you can pack capsule outfits really easily and everything matches, and therefore you pack less." Fashion journalist and blogger Monica Ainley agrees, adding, "It's also helpful to bring colours that will always mix well together. I love whites, reds, yellows and blues for summer travels." Lindsay Holland, of Ropes of Holland, is another fashion blogger who is seemingly always on holiday. In the past month, she's been in L.A. and the South of France, and she says the key to packing quickly is to rely on the basics you love. "Grab your favourite pieces," she explains. "Pieces that you know will get the most airtime, such as denim shorts, oversize linen shirts and a mix of swimwear." Monica Ainley says: "Visualise yourself once you're there! What mood will you be in? How many outfit changes will you really want to make per day? I do try to stage a trial for each item before putting it in my suitcase. I ask myself What are the chances of me actually wearing this?" Alex Stedman stores her essential travel items on standby in her suitcase. "I always keep a box of 'minis' and a pre-packed travel wash bag under my bag with all my beauty travel essentials, so I never have to wrack my brains trying to think of everything to pack," she explains of how she speeds up the packing process. "I also have a 'what to pack' notepad with a checklist so I know I have everything I need at a glance." Next up, how to get a new wedding guest look without even buying a new dress.